The Lexicon PCM42 combines Lexicon’s established and reliability with features for musician. Unique in concept and execution, the Lexicon PCM-42 performs all of the functions you would of a high quality digital delay line, while the door to realms of musical expression that were only a dream now. Imagine being able to overdub entire phrases of music, vocal or instrumental, layer layer, into complex arrangements IN REAL TIME! Imagine a device that lets you lock delay times precisely to musical for rhythmic and expressive enhancements. Imagine an unprecedented degree of footpedal control for live performance. Imagine a delay line that can not be audibly overloaded.Imagine a numeric display that tells you the EXACT delay time at any instant. Now all of this in a unit with the superior, field-proven audio quality and the established reliability of the Lexicon PCM product series, backed by the resources and reputation of the world leader in digital audio and you’ll imagining the Lexicon PCM-42, the cutting of music technology. ThePCM42 incorporates all of the innovative features that have made the PCM series the top performing delay lines on the market today: studio quality PCM (pulse-code-modulation) encoding for super clean audio: multi-waveform sweeps for realistic vocal doubling, rich chorusing. and unique effects: reliability and excellence of construction that have long been PCM series hallmarks. The Lexicon PCM-41 is the world standard in cost-effective, roadable delay processors and the PCM42 builds on this tradition. The 42 adds many new, sophisticated features including very long delay capacity and synchronizing metronome/clock, bringing totally new to top performing artist. The PCM42 combines a delay capacity of up to 4.8 seconds (with memory option) with a unique metronome/clock, infinite repeat/hold, and special foot controls to bring new possibilities in musical expression. use the delay memory as a short term “digital recorder” to enter entire phrases of music (as much as eight bars’) which will repeat indefinitely without degradation. Use the repeating phrases as background to lead parts, and dub any number of new parts in at will, to generate complicated, multi-layered arrangements LIVE. on-stage from even the simplest of inputs. 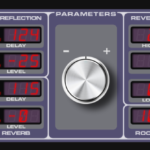 The metronome/clrxk feature provides the means to synchronize tempo with long delay periods. for a variety of fractional divisions of the delay period, it may used as a visible/ audible metronome. or as a clock for many automatic sequencers and percussion units, driving these rhythmic devices in precise synchrony with the delay period. Two new control/input Jacks. together With VCO, Bypass, and Repeat inputs, provide the means to control all of this power conveniently on stage. The Mix Control input allows smooth foot-pedal variation of the delay level. The Re-circulation Control adjusts the amount of delayed audio fed back to the input for multiple repeats. These jacks also serve as auxiliary Inputs to connect to other delay lines, equalizers, reverberators, etc. Super long delay times for new dimensions in music. Up to 4.8 seconds with memory option. Unique new metronome/clock feature enables synchronization of music and delay. Allows the user to generate musical backgrounds and textures with precise rhythmic control. 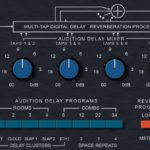 Accurate delay readout shows the exact amount of delay in effect at any time. Tracks all changes in delay no matter how rapid. New footpedal functions provide an unprecedented degree of performer control. Delay level, re-circulation, sweep, bypass and infinite repeat may all be operated by foot controls. Versatile Patching: Mix and Re-circulation Control Jacks may be used to connect PCM-42 with other processing gear in a wide variety of configurations, for exciting multi-processed effects. Input Overload Protection circuitry eliminates harsh digital clipping. Proven quality design and reliability Lexicon’s traditional attention to excellence, together with field-proven technology ensures solid, trouble-free performance show after show, session after session, year after year. Lexicon PSP 42 is a high-quality digital stereo delay and phrase sampler plug-in based on the legendary Lexicon PCM 42 processor famous for its distinctive sound and unique concept.